Wildness is the quality of being wild or untamed; a quality produced in nature (Thoreau 1906); that which emerges from a forest (Micoud 1993). The relationship between ‘wildness‘ and ‘wilderness‘ is wilderness is a place where wildness occurs. Both are disappearing due to human encroachment, damage and contempt for nature. Our commitment to utter respect for the rights and freedoms of wildness in nature are underpinned by our philosophical belief in habitat-centric ethics. Native across Central and South American regions, but now regionally extinct in El Salvador; Uruguay. is a high priority for conservation effort in many jaguar range countries. The Habitat Advocate acknowledges that since human industrialisation and population growth, many nonhuman species have been unforgivably either forced into extinction or forced by humans toward the edge of their extinction. Yet humans continue to focus on breeding their own babies. Land mammals, ocean mammals, native birds, fish, amphibians, invertebrates , fungi, algae and plant species have unsanctimoniously become victims of our human breeding pathogen. At The Habitat Advocate, our special conservation focus is with the plight of land mammals and specifically top order predators – those at the top of the food chain and indeed at most risk of extinction. Throughout this website we liberally use the term ‘wildlife‘ to refer to top order predator mammals. The priority high risk wildlife are classified by the authoritative International Union for Conservation of Nature (IUCN) as Critically Endangered. * Species on the Edge of Extinction (EE) is a category we have taken the liberty to create. These are the species currently at imminent risk of extinction.We consider 90% of all UN funding (not just IUCN, all UN) ought to be directed to this category. The severity exceeds crimes against humanity irrespective of the scale, because humanity is not on the edge of extinction. 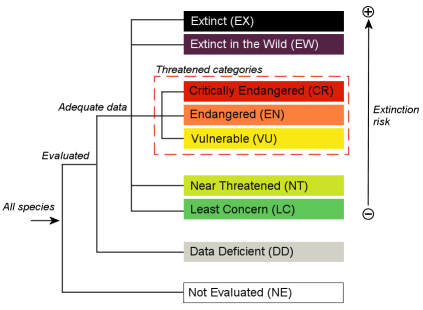 The IUCN Red List Categories and Criteria (see below) are intended to be an easily and widely understood system for classifying species at high risk of global extinction. The assessments are based upon the best available evidence undertaken by IUCN-delegated Red List Authorities, obtained by the IUCN Red List Criteria Working Group (CRWG) and adopted by the IUCN Council. The most recent update of the IUCN Red List categories and criteria is 2008 and the most recent assessment and categorisation of the world’s species at risk of extinction was conducted in 2008. At the IUCN World Conservation Congress in Barcelona on 6th October 2008 , according to an update to The IUCN Red List of Threatened Species™ , the world’s mammals have been confirmed to be at an extinction crisis, with almost one in four at risk of disappearing forever. At least 1,141 of the 5,487 mammals on Earth are known to be threatened with extinction, yet the real situation could be much worse since 836 mammals have been listed as Data Deficient. At least 76 mammals have become extinct since 1500. ‘The results show 188 mammals are in the highest threat category of Critically Endangered, including the Iberian Lynx (Lynx pardinus), which has a population of just 84-143 adults and has continued to decline due to a shortage of its primary prey, the European Rabbit (Oryctolagus cuniculus). ‘China’s Père David’s Deer (Elaphurus davidianus), is listed as Extinct in the Wild. However, the captive and semi-captive populations have increased in recent years and it is possible that truly wild populations could be re-established soon. It may be too late, however, to save the additional 29 species that have been flagged as Critically Endangered Possibly Extinct, including Cuba’s Little Earth Hutia (Mesocapromys sanfelipensis), which has not been seen in nearly 40 years. ‘Nearly 450 mammals have been listed as Endangered, including the Tasmanian Devil (Sarcophilus harrisii), which moved from Least Concern to Endangered after the global population declined by more than 60 percent in the last 10 years due to a fatal infectious facial cancer. ‘The Fishing Cat (Prionailurus viverrinus), found in Southeast Asia, moved from Vulnerable to Endangered due to habitat loss in wetlands. Similarly, the Caspian Seal (Pusa caspica) moved from Vulnerable to Endangered. Its population has declined by 90 percent in the last 100 years due to unsustainable hunting and habitat degradation and is still decreasing. 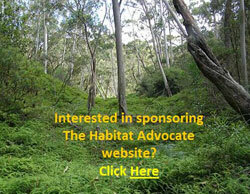 ‘Habitat loss and degradation affect 40 percent of the world’s mammals. It is most extreme in Central and South America, West, East and Central Africa, Madagascar, and in South and Southeast Asia. Over harvesting is wiping out larger mammals, especially in Southeast Asia, but also in parts of Africa and South America. ‘The Grey-faced Sengi or Elephant-shrew (Rhynchocyon udzungwensis) is only known from two forests in the Udzungwa Mountains of Tanzania, both of which are fully protected but vulnerable to fires. The species was first described this year and has been placed in the Vulnerable category. The International Union for Conservation of Nature (IUCN), based in Switzerland, has compiled a universally authoritative taxonomy of all the Earth’s plants and animals categorising the risk to which each species is threatened with global extinction. Of the plants and animals that have been globally evaluated by the IUCN and included on the IUCN Red List of Threatened Species™ , the broad general catergories have been assigned. From this authoritatve source, The Habitat Advocate shall endeavour to provide information about each of the top order mammals at risk of global extinction. 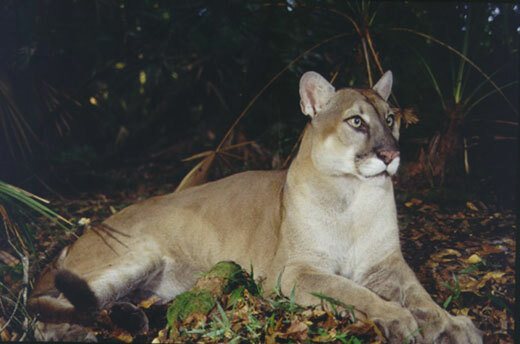 The Florida Panther’s natural habitat is the low pinelands, palm forest, and swamps of Southern Florida. 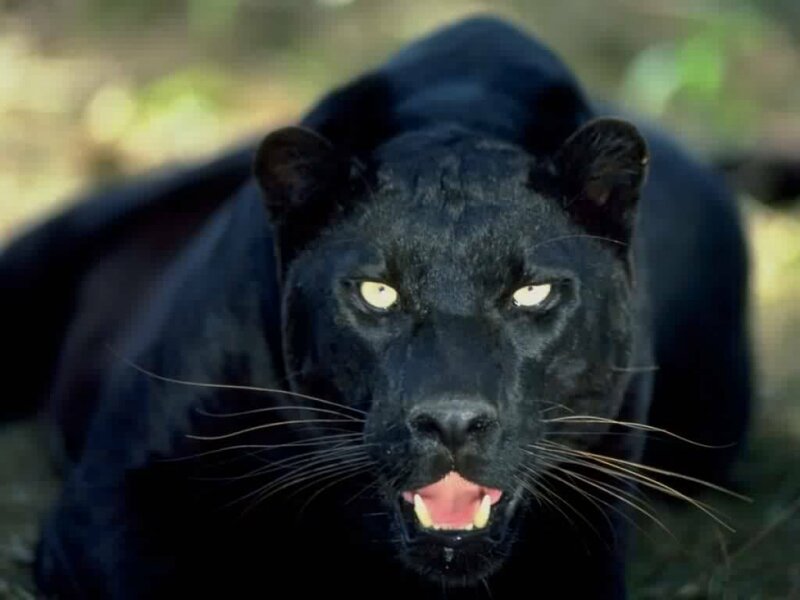 Human destruction of these areas has deduced its range to just 5% inside the Big Cypress National Preserve, the Everglades National Park, and the Florida Panther National Wildlife Refuge. with its numbers decreasing at an alarming rate. It’s thought that there are just 80 to 100 of the Florida panthers left. The taxonomic classification of animals and plants (‘taxon/taxa’ for short), are categorised in the IUCN Red List according to risk of global extinction as per the following table. >80% pop. loss in past 10 yrs ! >50% pop. loss in past 10 yrs ! >30% pop. loss in past 10 yrs ! Least Concern LC Not at risk, and includes those that are widespread and abundant. The IUCN Red List Categories and Criteria were designed for interpretation at a global scale, yet at a national or more localised scale, the assessed category may well be of a higher risk. For example, taxa classified as Least Concern globally might be Critically Endangered within a particular region where numbers are very small or declining, perhaps only because they are at the margins of their global range. It is recommended then to refer to guidelines prepared by the IUCN/SSC Regional Applications Working Group. 4.7 Extreme Fluctuations Population size or distribution area varies widely, rapidly and frequently, typically with avariation greater than one order of magnitude (i.e. a tenfold increase or decrease). 4.8 Severely Fragmented Most individuals are found in small and relatively isolated subpopulations (in certain circumstancesthis may be inferred from habitat information).Such small subpopulations with a reduced probability of recolonisation, have a heightened risk of extinction. 4.9 Extent of Occurrence Area contained within the shortest continuous imaginary boundary which can be drawn to encompass all the known, inferred or projected sites of present occurrence of a taxon, excluding cases of vagrancy. 4.10 Area of Occupancy Area of occupancy is defined as the area within its ‘extent of occurrence’ which is occupied by a taxon, excluding cases of vagrancy. 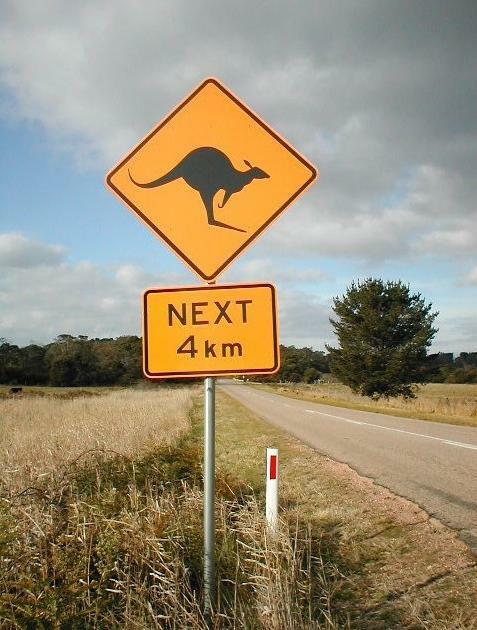 4.11 Location Geographically or ecologically distinct area in which a single threatening event can rapidly affect all individuals of the taxon present. 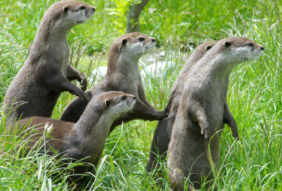 are seriously threatened by rapid habitat destruction, hunting and pollution.